Part 1 of this post dealt with mobile patterns designers can implement for products whose limited hardware budgets seem to be at odds with their desire for interfaces that “look, feel, and act like iPhones.” As I mentioned at the end of that post there are some situations — lots actually, but we only have room to cover a few here — where designing interactions based on smartphone patterns is not always appropriate or sufficient. There are generally two popular types of touchscreen technologies: capacitive and resistive touch. Capacitive touchscreens (commonly used in smartphones) rely on the electric conductivity inherent in our bodies — or fingertips — to sense a touch event on the screen. Resistive touchscreens consist of two layers: When mild pressure is applied to the surface with your finger or any object (like a stylus), one layer is pressed against the other and a touch event is triggered at the exact point where those two layers meet. The magic of modern smartphones stems from their use of capacitive touchscreens, which allow for elegant multi-touch gestures. Designing for natural gestures can be a major challenge or even impossible on resistive touchscreens. Each technology has its pros and cons, but often the biggest deal breaker for capacitive touch is its sensitivity to liquid (an electrical conductor) and resistance to gloves (an insulator). These cons have huge implications in many scenarios — particularly in environments where liquids may be unavoidable (think hospitals, labs, or even outdoors with precipitation), and gloves are a requirement (also hospitals and labs, industrial settings, hot/cold climates, hazmat handling, etc.). Capacitive touch is not the right solution in scenarios where liquids are unavoidable (hospitals, labs) or gloves are a requirement. Smartphone patterns are not the answer for the many UI-centric products whose physical criteria expand beyond fitting in your pocket and being held in your hand. Imagine we need to design the interface for a device intended for use in a hospital operating room (OR). There are a lot of human factors at play here. For the most part, the OR is a sterile environment where nurses, anesthesiologists, and surgeons are covered head-to-toe, including their hands, which are gloved. There are a variety of patient monitoring devices scattered around the room. Liquids whose source could be the patient, medicines, or surgical or cleaning applications, could be anywhere. 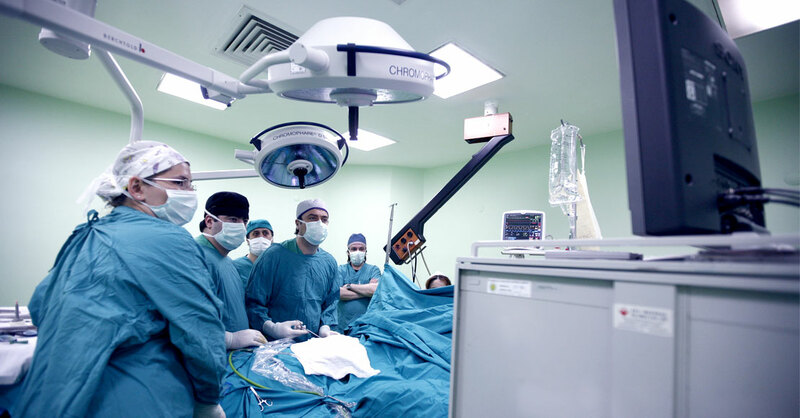 Spotlights, instrument tables, and other devices surround the operating table. All of these variables impact the design of both the workflow and user interface. A common smartphone pattern exemplified in Part I is the sliding drawer navigation menu. While this works well on a handheld device with limited screen real-estate, it might not be appropriate for a patient-monitoring interface. Requiring an additional touch interaction to reveal the main navigation might not be ideal in an environment where the user’ workflow doesn’t leave a second to spare. There are many human factors at play in a hospital operating room (OR) that impact the design of a device’s user interface. There’s been a lot of buzz in the industry about the Tesla Model S dashboard user interface. I think this is a great example of pushing the envelope in an industry that’s been pretty standardized for half a century. However, giving the UI a test drive (pun intended) left me wondering whether centralizing most of the dashboard controls onto what’s basically a giant touchscreen tablet was a good decision. Given a highly regulated automotive industry, surely Tesla has done due diligence with user testing, but there are still some significant usability — and ultimately safety — concerns. For instance, if driving the car is the primary task (and it better be! ), could that task be impacted by the burden of touch target acquisition to adjust something like the interior temperature (as opposed to reaching for and turning a physical knob)? Does the Tesla Model S’s dashboard user interface distract too much from the user’s primary task (driving)? In an industrial setting, we have some of the same concerns we might have in the OR. The user may be required to wear safety gloves and goggles. Liquids may also be a concern. Information on-screen might need to be legible from farther than a few feet. There may be environmental distractions such as heavy machinery, other workers, and loud noise. If we were designing a product interface for this type of environment, we would need to go beyond smartphone patterns and focus on very specific workflows. User interface design for an industrial setting must take into account that factory environment’s specific set of concerns. Smartphone patterns can be useful because of their ubiquity and familiarity. However, an IxD outlook that is limited to these patterns is myopic, and ill-equipped to address the wide breadth and depth of human-computer interaction contexts. Slapping a smartphone-like interface on your product is probably not the answer. And the truth is that there’s no silver-bullet solution to UI challenges. Strike a balance. Use smartphone patterns where they make sense, but give deep consideration to your users’ needs. Be creative, but also be practical when you’re designing for critical contexts. You never know when your interaction design might save your users’ time, money, or even a life.